confectionery, jewellery, special orders and seasonable products. to us with proof of purchase and we’ll arrange a repair, replacement or refund. All job vacancies are managed at store level, please contact the store directly. Please be aware that certain stores have different opening times. You can reserve stock over the phone for collection, please contact your local store using the storefinder. Do you accept Toymaster gift vouchers? We accept Toymaster gift vouchers at Haywards Heath, Lewes & Rustington. Do you sell gift cards and gift vouchers? We do sell gift cards/gift vouchers in all our stores. Can your gift cards and vouchers be accepted at any of your stores? 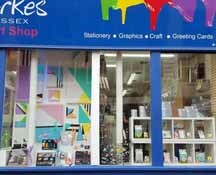 We offer 10% student discount on stationery, pens and art materials when a valid student ID card is presented.